Love the composition, only thing that is a bit distraction is the “red” spot at the bottom left on the rocks? I would “heal” that out, but still an amazing composition! Absolutely love it !The leaf in the bottom left sets it off . Good work ! This photo was taken at Split Rock Falls Elizabethtown, NY. 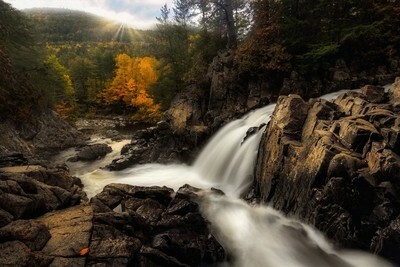 Split Rock Falls is in the Adirondack Park and is a part of the Bouquet River. This was over an hour and a half trip up to the Adirondacks. My father and I first went to Roaring Brook Falls which is about 10 mins further north but were not getting what we expected there. We had decided to run over to Split Rock Falls before the light had become to harsh. Every time we go up north to the Adirondacks Split Rock is always a stop. However, this time we did not plan on stopping there but as luck would have it our plans changed. This photo was taken at 7:44am October 6, 2018. I got lucky with the lighting! It was early enough in the day and there were clouds in the sky. At this point the sun was not taking over the water and given a lot of glare. The sun was peeking over the mountain and beautiful light glowed throughout the scene. This picture was taken using a Canon 5D Mark II, EF 17-40mm lens. Tripod was used at F/22 1.6 sec ISO 50. Camera was on manual and I did use a circular polarizer. There is always some post processing when shooting in raw. Adding back some color, contrast and sharpening. I also took two exposures of the shot and blended them together in photoshop to help bring out the blue sky. I always pack my wide angle lens Canon EF 17-40mm lens incase I need to take a wide angle shot. On my Canon 5D Mark II I always start off with the 24-105mm lens and make sure I pack all of my circular polarizers to fit each lens. My second camera is a Nikon D7100 16-85mm lens. I love using this camera taking macro shots with the Tokina AT-X M100 pro D macro lens. When doing macro shots I do use extension tubes and macro ring light if needed. There are so many waterfalls around New York. I have been to a lot after all these years. What I do is get to know the area, research it online. I visit a spot numerous times and take some shots. Try every angle imaginable and all times of the day! Its important to learn all you can about the scene you want to shoot and have a vision of how you would want to capture the scene. Most importantly try to be patient and keep trying!